Inside and outside the church there are an abundance of bullies. Unfortunately, there are even more who have been bullied into silence. Seeing injustice and mistreatment the silent ones turn their heads away hoping that it will go away, afraid that if they speak up and take action they’ll lose friends, lose their position or just plain lose the fight. As a result, people get beaten up and destroyed because the silent ones are more afraid of the bullies than of God. Power and control at various levels are what bullies seek. But, Jesus is the only One who has complete power and control. This is the One we should fear the most—the One who holds our entire life in his hands. 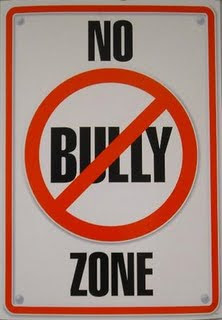 Wherever we encounter bullies or see others bullied we cannot be afraid to speak the truth. The harm bullies inflict is detrimental and destructive, but their effects are mild compared to God’s response if we don’t speak the gospel truth in boldness and love. Silence only affirms the bullies attitudes. So, don’t affirm bullies! Shout out God’s truth today! Thought for the Day: Who in my life am I afraid to speak truth to? Help me, Jesus to no longer be silent but to speak your gospel truth.Amen.